Leading up to that Lopez has had many run-ins with quite of few people who would love to get Lopez as a “slave for a day” for reasons Lopez doesn’t sit well with. With guest appearances from rapper legend Snoop Dogg and former Los Angeles Mayor Antonio Villaraigosa, “Lopez” has an ensemble of cast members that help portray a sense of realness to the chaotic hilarious world that Lopez finds himself in. Lopez’s first episode didn’t hold anything back. Touching upon personal topics to Lopez’s real life disputes with neighbors to more serious issues like cheating and the divorce with his wife of 18 years. Lawndale Bilingual Newspaper: Right from the start in “Lopez” you set the tone with stereotypes and Hispanic misconceptions. A theme that’s carried throughout the first show episode. How much of that was real? 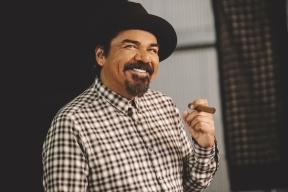 George Lopez: The dispute with my neighbors over my trees was real, the cheating and divorce is real, and the going to the school and them asking for money is really real. (Laughs) I’ve always found success in things that are real. TV land wanted a show that was real and closer to me than anything that I had ever done. Keith Cox from TV Land said we’ve seen George Lopez the sitcom, we’ve seen George Lopez the stand out, and I want the George Lopez nobody sees. I think we’ve accomplished that with the show. Did the first episode of stereotypes and racism set the tone for the rest of the “Lopez” series? It will stay, of course. The writers John (Altschular) and Dave (Krinsky) the creators of “Silicon Valley” are great. I’ve had plenty of good writers around me, but these guys didn’t need a lot of supervision from me. I think they were big enough fans that they knew what direction to take the show. This has been the one show I’ve been a little bit more distance from because I had so many things to do as an actor. I think that worked out better when I didn’t have my hands over everything, only when I needed to. It’s funny some people consider my first show as a failure but it’s hard to think that the show is a failure when it was on and still on. There’s been a lot of respect shown to me for the things that I’ve done especially by Latinos. There’s a lot of negatively in comedy and people that don’t like me, along with social media being able to shots at somebody 24 hours a day. This is the first show that was opened and the critics liked and the feedback has been great. Even though I’m a season veteran, I’m experiencing something for the first time. Which is appreciation of my work. With the debut of “Lopez,” what are your thoughts on it being out and widely received by critics and fans alike? To get off on a start like this…I think people will see the show and think it may be tough to watch specific topics. For me, it’s kind of cathartic and entertaining. I still get to be me and do standup, it’s the best. TV Land has given me a place to have the best part of my life. “Lopez” airs Wednesday nights on TV Land. Photos courtesy of TV Land.